Did You Forget To Decorate The Hallway? The Daily Nest: Did You Forget To Decorate The Hallway? Did You Forget To Decorate The Hallway? Do you ever have those days when you feel really productive? I had a very productive day yesterday. Not that I did anything earth shattering! You know the usual, wrote a post, did some banking, grocery shopped, organized and cleaned out my fridge, did laundry, cooked some Bangin grilled shrimp for dinner, and spray painted a couple of items that I'll be posting on in few days. And of course always thinking about what's next for finishing up the living room side of the remodel. But, as I've said before I'm trying to take things slow and not rush this time. It's very hard for me to do that, because I'm a very fast decorator! The other part of the remodel that I want to take on is the "Hallway!" Now I've gotten some head turns from friends and the husband with very puzzled looks, when I mention decorating the hallway. Because it's the forgotten room!! There is something about hallways that have always intrigued me. They are kind of mysterious in way. But, I think you tend to forget about decorating your hallway. Here's some examples of some beautiful, well thought out hallways. The ones with more than just family pictures in them! What's not to love about this hallway? The bookshelves, the beautiful curved beadboard ceiling with dark wood beams! I could see myself lingering there and taking forever to come out of the other side! 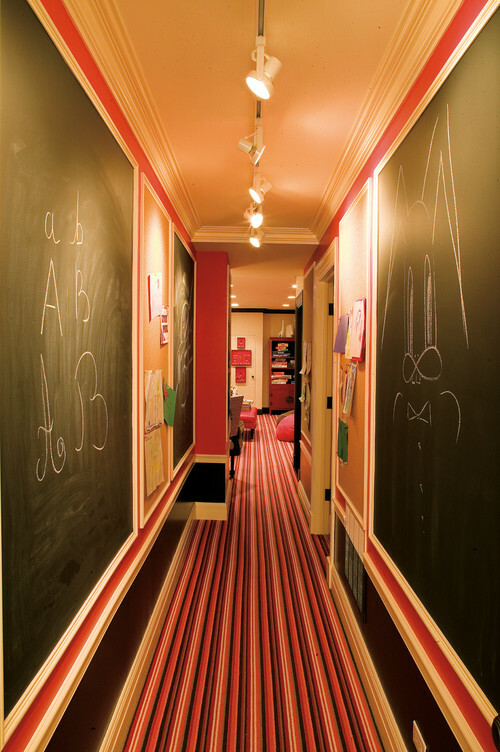 How cute is this hallway leading to a playroom? Painted with chalkboard paint, your kids would love it! Although my hallway is not as grand as these, I like to take elements of them and incorporate them into my vision. We'll see where the hallway leads to! Did you forget about your hallway?